It's a form builder. How different can it be? Well, it's the difference between using a form as an end product and using a form as the integral start of a process. Springshare's LibStaffer Workflow Forms are designed to have a life beyond the moment they're filled out. The form was submitted? Excellent. But that's just the beginning! File uploads - Perfect for job applications where you want a candidate to upload a resume, etc. Routing - If a certain box is selected in the form, it gets routed to a particular member of your staff. Stage creation - Advancing the form through stages from the first looks to approvals, decisions and more. Notes - Establish a clear audit-friendly discussion between colleagues at the various stages by leaving detailed notes for transparency. These are performance forms. They are active, super easy to create, and useful in a way that makes you wonder how you could have ever worked with one-point-only forms for so long. Thinking about all of the different ways you could use these action-hero forms? That's the right impulse! They are versatile enough to help you with the ranging cycle of work life. From the initial hiring process to vacation requests to arranging longer leaves or approving conference attendance, LibStaffer Workflow Forms have you covered. Brainstorm with your team to discover a number of cases that call for a form that routes to specific people, keeps notes, and moves through stages as part of the decision-making process. It's that time of year - workstudy students are flooding your inbox looking for placement in the library! Funnel all requests into one place and out of your inbox. Are you creating a Human Library event at your library? 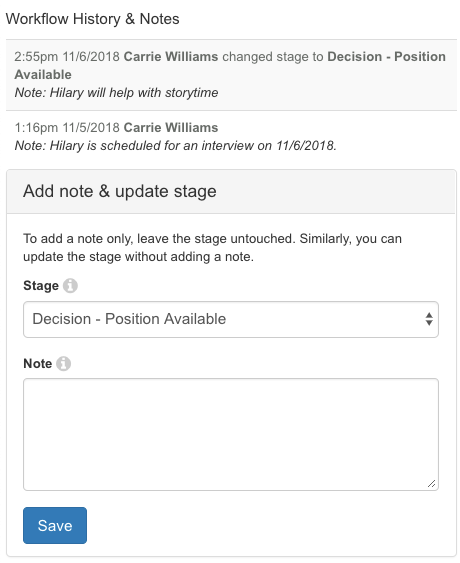 Use LibStaffer Workflow Forms to funnel all 'live book' submissions into one place and then use stages to route submissions through your processes. Sabbatical requests go through a strictly adhered-to process where different staff are involved at differing stages. Create it as a Workflow Form and keep your eye on the 'touches' that each request goes through. Funnel all staff requests for professional development... from conference attendee, to workshop, and more. Customized stages include: Budget Consulted, Discussion of Merit, etc. If staff need to request expensive equipment purchases, route all requests through a Workflows Form and follow the progress through customized stages. Looking for dogs to staff your 'Read to the Dogs' program? Create a Workflows Form and ask for breed info, therapy dog certification, and allow volunteers to upload photos of their dog.